Binky is the cat that came afore me. The Binky and her brother showed up at our house in San Jose as we drove up returning from a trip to Hawaii. Our friend was taking care of our house and our other cat Cherise, and Binky and her brother kind of moved into the back yard because there was a bowl of Cherise's food out there for her patio dining experience. Binky was mommies best friend for 14 years. She was 14 lbs and then she became hyperthyroid and started to lose weight rapidly. mommie had her on medicine for quite awhile but then she started not eating and her body started to give out. She put up a gallant fight not to leave her mom. Today when mommie was driving home she heard this story on NPR. it talked about cats and thyroid disease and a correlation with high consumption of canned cat food. Binky loved her stinky goodness, i do not eat stinky goodness. Oh No! all I eat is stinky goodness now since my .. uh. .. pee problems. Binky looks like a very sweet cat. tatiana sez: i've never tasted stinky goodness in all of my 8 months, honey. oh! and i remember sweet binky. she was precious. It sounds like Binky was a wonderful cat. Interesting information about hyperthyroidism. We Sphynx need to eat wet food because we have fast metabolisms to help keep us warm, and there aren't enough calories in dry food alone for us. Not to mention that many vets believe wet food is healthier than dry food. Seems like there's not perfect food out there. 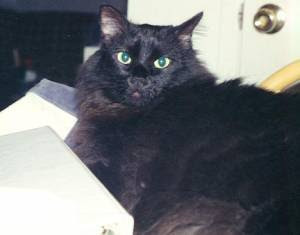 Binky was a very beautiful kitty! OH MY GOSH! My Mommie had a kitty before me that was also black and also named Binky! And then she lost Cerise last June, spelled almost like Cherise! How coincidental is that! Binky sure was beautiful! I eat a little Stinky Goodness every day (about 1/3 of a can), and fill up on crunchies. Awwww. I must say, HoneyP, this story filled me with warmth and love. It is a great feeling knowing your Mommie has a very big heart filled with nothing but genuine love. She's was a very pretty girl, and very floofy, too. We like anybody called "Woobie". Binky was very beautiful! She looks like she had the right attitude too! !